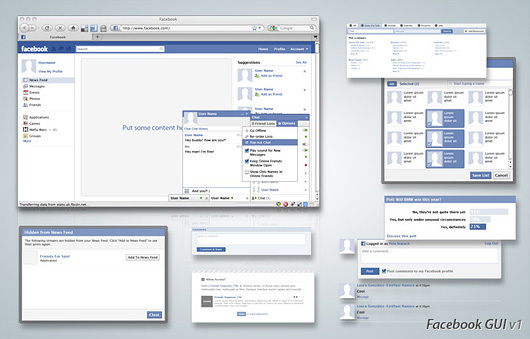 Facebook GUI PSD | Shelby White - The blog of artist, visual designer and entrepreneur Shelby White. 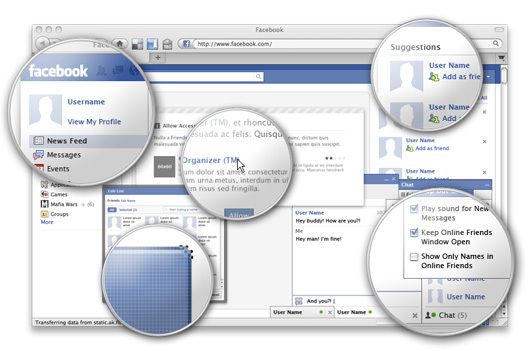 SurgeWorks just released this free Facebook GUI PSD. The kit was is under creative commons so it can be modified as you wish without any restrictions. I always like these kits (iPhone kit released not long ago) because you can see how other PSD’s are compiled. The kit has everything from the site: logo, UI elements, main window with the header, menu, chat window, modal components, comment boxes, buttons, message boxes, tabs, the whole works. The components are even built using vectors and blending options, so that scaling and editing the objects will not be a problem. SO AWESOME, I love that people are willing to share their hard work with the world so we can spend our time doing other things. The more people share, the more other people can focus on innovation instead of repetition. Of course, there’s something to be said for working through the basics.. build a strong foundation before you start building a skyscraper blah blah blah. OH perhaps people with their 10,000 can use the shortcuts, and everyone else can earn their way?